My question is if you have experienced these things why haven't you researched more about it? I have had a couple of experiences myself to know that its real, but i have been digging about in this rabbit hole for a couple of years now and on trying a few methods got a result quite quick (rope method) got the experience of my whole astral body starting to shake intensely and i came out cause it was scary, that happened twice, i have lucid dreams now and again also, quite a few as of late happening in a dark void with an unseen force pulling me down, i know I'm in a dream and can decide when to leave but right now im being pulled about by something un the dark, when it pulls me down too fast i come out and I'm wide awake thinking that was cool. But like i say if you start getting more adept to it apparently the possibilities are endless. My goals are to take things out my diet like sugar and coffee, and more yoga and meditation, to try and discover thus unseen world with more awareness. I think the people that control the information use it to rule, they keep us in the zombie state so that we feel hopeless and in need of them, when actual fact we are omnipotent, omniscient and omnipresent in our own minds and can traverse the universe at will... When you add in magick and rituals you can make change in the physical world as well. As within so without... And i guess many other religious texts imply the great powers that lye within. Have you ever seen the electricity ? If yes, then did it look like it was surrounded by black smoke ? 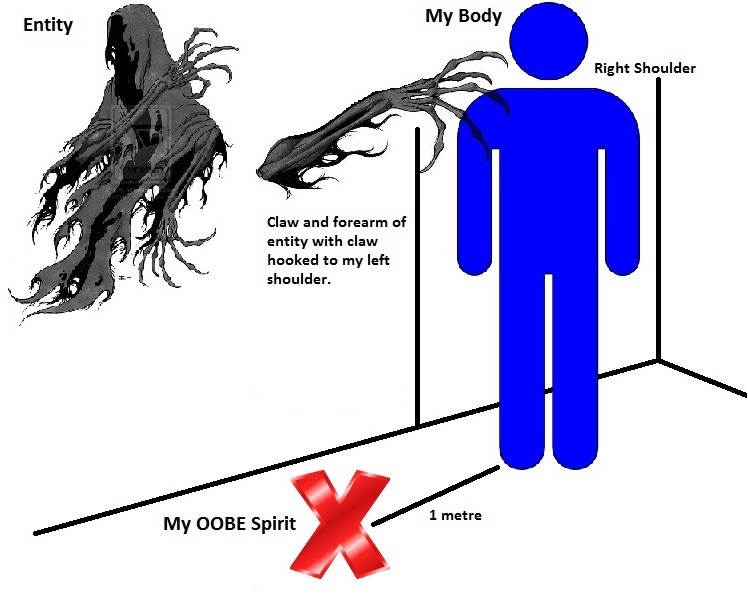 Had a awake OOBE once where i saw a shade hooked to my left shoulder blade. i believe the Islamic community calls them Shaitan Jinn. About 6 months ago i was working night shift and zoneing out in the lounge area in the dark when i turned round and one of the young people i was looking after was sitting in lotus position with his eyes half closed and bloodshot with goo coming from eyes mouth and nose area, it was like he was under heavy drugs and sedated, then i came out and he was gone, i have heard that we when we are unconscious of the astral world while asleep we appear as zombies to those that can traverse the astral, is this right enough by your accounts.? I don't know how to describe what happened to me over many years.....so I'll just tell my story. I hope other people will know what I'm talking about....so I'm not alone or a freak! I have always been an empath. I absolutely hate going to any kind of emotional event, like a wedding or funeral (even if I got dragged there and I don't know anyone involved), because I will always pick up and absorb other peoples emotions. It's overwhelming for me. Does this have anything to do with this? I don't know. Night terrors/nightmares bringing on sleep paralysis.. It is as simple as that. Another "know it all" that doesnt know the answer and wants to prevent others from seeking out the answer. Nothing to see here folks. This guy can't even muster up enough of an attention span to follow the most basic forum etiquette, I wouldn't take anything he says too seriously. Very interesting. I've had this happen, very vivid, definitely real, in fact more memorable than real life, although I felt myself leave my body from my foot. I remember floating about my room then thinking to myself I should look out the window, when I did I noticed the sky was a deep purple. I then floated to the top of my stairs and was going to go down, but heard and felt something very creepy, so freaked out and somehow got back to my body through my foot and woke up. Whoa thats an awesome and weird experience. I wouldn't say people unconscious of the astral appear as zombies. They act like zombies, not literally, but how people do in this world like you mentioned in your earlier reply. A lot of the time they are just not aware of what is really happening. There are endless amount of realities in the astral though, i think really anything is possible. And yea i definitely think the true rulers of this world are far more knowledgable about magik than they allow the people to see.